Global Power Supply, LLC. (GPS) - http://www.globalpwr.com, a privately held leader in integrated power solutions, is expanding its operations in Nevada. 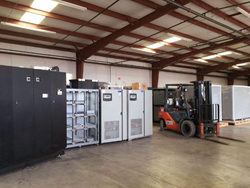 The UPS Systems (Uninterruptible Power Systems) division has doubled in capacity by moving to a new location at 27 Bruce Way in Carson City, Nevada. GPS welcomes Michael Howard to the team. Growing on last years acquisition of the Power and Environment International (PEI) UPS rental fleet, Global Power Supply provides temporary and permanent backup AC/DC power to critical facilities including hospitals, data centers, telecom, construction, government and utilities, manufacturing and the entertainment industry. "We are excited to increase our warehouse and production capabilities, this will allow us to bring in more high quality new, surplus, and used assets and give our customers additional options," said Global Power Supply CEO, Ron Zamir. The Global Power Supply also welcomes Michael Howard and his many years of backup power sales and support to the UPS Systems division. As Senior Account Manager of the Critical Infrastructure Division, Mike brings over 20 years of industry experience to the team. Based in Orange County California, Mike will provide added capacity to division sales efforts in the region and nationally. "Mike is a tremendous asset with his career experience starting back in 1997 with PEI. Our customers will enjoy Mike's skills and his ability to keep long term relationships," commented PEI's Marc Basche. GPS is a leading provider of high quality backup and prime power systems including new and refurbished diesel and natural gas generators, switchgear, transfer switches and UPS systems providing exceptional customer service including project management and logistics throughout North America and internationally. GPS offers flexible financial options including leasing and rental packages, turnkey installation, start-ups, maintenance, trade-ins, purchasing of used or surplus assets and deinstallation of infrastructure from data centers and other critical facilities.